Apple’s review process seems to have become more efficient. The new version was approved in record time (less than 4 business days–and one of those a Federal holiday). It should be appearing in your “updates” list within the next couple of hours. I have a couple of demo/documentation videos that I put together. I need to add a voice over and upload them to YouTube, but expect to link to those shortly. Do let me know if you find any bugs or glitches with the new version. I’ve been hammering at it pretty hard, but I could have missed something. It’s been a long time since I had time to work on my D&D/gaming apps. You may have noticed that I released a new version of Hex Map Pro this week. Not a major update, but I added a few features that people had mentioned. Updated for the larger iPhone 5 screen. Grid color can be changed. Option to have the text on the back of each token automatically match the front. As I get suggestions from people about what I should do next, I often wonder how you actually use the app. Are you using it to run RPG games? Design maps? Play other types of games? I’ve realized that I’m a big handicapped in improving the app because I’ve literally never seen anyone (except my kids) actually use Hex Map Pro. So I’d love to hear from you and maybe get some screen shots. Leave a comment if you’re willing to chat via e-mail about your use of the app. Thanks. Apple rejected my Old School Treasure Generator app. And not because the name was too long. 2.12: Apps that are not very useful, are simply web sites bundled as apps, or do not provide any lasting entertainment value may be rejected. We found that the features and/or content of your app were not useful or entertaining enough, or your app did not appeal to a broad enough audience, to be in compliance with the App Store Review Guidelines. I somewhat see their point, but still it hurts a bit. I’ll incorporate the functionality into Old School DM at some point, but I liked the idea of a simple one-screen free app to help DMs. Oh well. It’s been over a month since I posted anything here. Let me catch you up on what I’ve been working on. Last night I submitted my 5th app to the App Store: Old School Treasure Generator. The name is a mouthful, but it does what you’d expect if you’re a user of Old School DM. Enter the treasure codes from the Monster Manual listing, tap Go and you get a randomly generated treasure hoard. It’s a simple, one-screen iPhone app. This started off as a new feature for the Old School DM app, but decided to release it as a stand-alone app for now. It’s free, so don’t complain too much that it doesn’t generate the values for each gem and piece of jewelry (yet) and roll the random magic items for you. 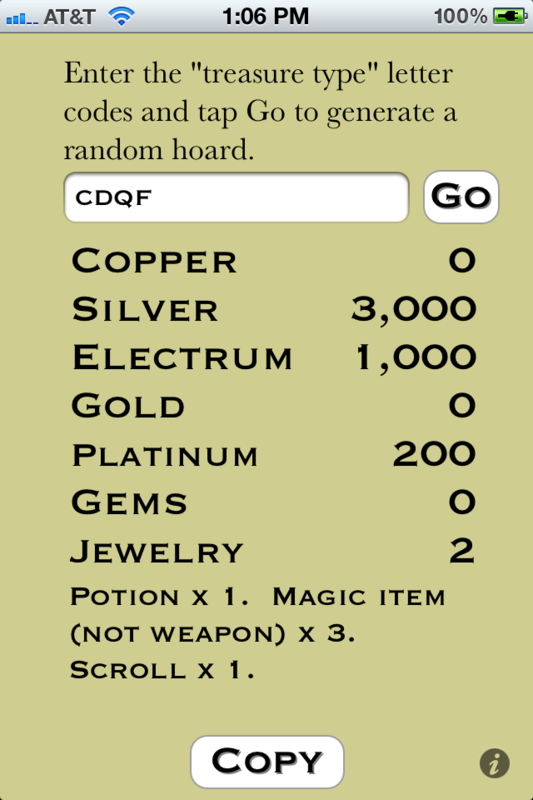 It’s exceedingly unlikely that I’ll ever add the random magic item generator–primarily for copyright reasons, but also because it would be a PITA to enter all the necessary data. And besides rolling magic items is fun and (at least in my experience) requires quite a few “thumb-on-the-scale” non-random adjustments by the DM. Look for this app in the App Store next weekend. I’ve also been working on two other apps: Old School DM and a new app I’m calling 3″ x 5″. Old School DM is being updated to work properly on the iPad. This will be added to the existing version as an update (although I’m sure you all would have been thrilled to buy the app again for the “HD” version like some companies offer, right?). No ETA on this yet. The new app (should have been my 5th app, but it will be my 6th since the treasure one was quick and easy), is a spin-off of Hex Map Pro. Instead of tokens on a hex board, it has 3×5 cards on a table top. Personally, I like to brainstorm and organize my thoughts on index cards, and since the Hex Map app was (I thought) 90% of an index card sorting app already I decided to create a new app. Then I started to get clever, excited, greedy, grandiose, or something and added extra features. It turns out that determining which arbitrarily rotated rectangle is “close” to which other rectangles is non-trivial. In any case, it’s probably a couple weeks away from being ready for release as a 99c app. It’ll be competing with plenty of free somewhat similar apps (note taking/to-do/brainstorming) apps and some paid ones, so I have no idea how well it will do. Once that gets released, it’ll be time to show Old School DM some love and get a new version of that out. Then back to Hex Map or perhaps a quickie 1st edition AD&D character generator. 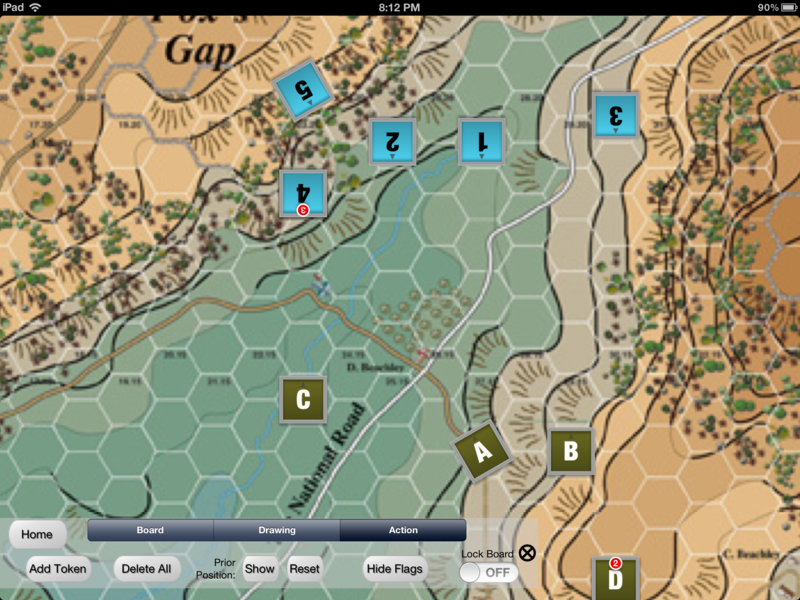 That would be another free app to serve as a “gateway drug” for Old School DM and/or Hex Map Pro. I implemented the logic for that app in Perl a few years ago, so it should be fairly easy to turn it into an iPhone app. Famous last words of course. This weekend I downloaded and watched some presentations from the Apple Worldwide Developers Conference to get some ideas how to best convert Old School DM for the iPad. Instead I was inspired to “fix” some shortcuts I had taken with the Hex Map Pro user interface. I hadn’t realized these little details until I saw what thought and care went into Apple’s own apps and some others they highlighted in the training. My daughter thinks the improvements are “awesome,” and I know some of you will appreciate then. Well worth the effort. I’m going to go ahead and let 1.1.1 get through the approval process, and then I’ll submit 1.1.2. Fixed the link to my support site (yes, again). The top tip the triangle-shaped token no longer gets snipped off (unfortunately it’s now even smaller). As you change the color of a token, the token on the board (and control panel) adjust in real time. When you drag a token, it “hovers” a little bit. Tap and hold the Shape or Size button to bring up a popover that let’s you immediately choose the size and shape. New boards default to a pattern instead of boring tan. Single tap anywhere on the board to close the token control panel. Hex Map Pro 1.1 was approved today (a week after being submitted, just like every other time). I’m working on a help/support page which you can find here. Too bad one of the minor bugs in 1.1 is that the link to the support site doesn’t actually work on the iPhone (and I forgot to add the link to the iPad version). D’oh. While I waited for 1.1 to past muster with the lovely and talented App Store app screeners, I found a few non-showstopper bugs. These have all been stomped out, and I’m submitting Hex Map Pro 1.1.1 tonight. Fixed the Support link on iPhone; added link on iPad. Fixed the font not always updating correctly in the token control panel. Fixed the background color of the “prior position” “ghost token” when a custom color is used. Fixed a long standing bug where deleting a token selects the oldest token instead of the one created just before the one deleted. Deleted three slow-loading background images that I was using for debugging and weren’t intended for inclusion. Maybe one or two other things that I’ve forgotten. Look for Hex Map Pro 1.1.1 this time next week (unless I hear reports of other bugs that I need to fix and thereby restart the one-week app approval clock. And for you patient Old School DM users, good news: the updates to make it work natively on the iPad are well under way. This app has my attention now after Hex Map Pro monopolizing my spare time for the past few months. 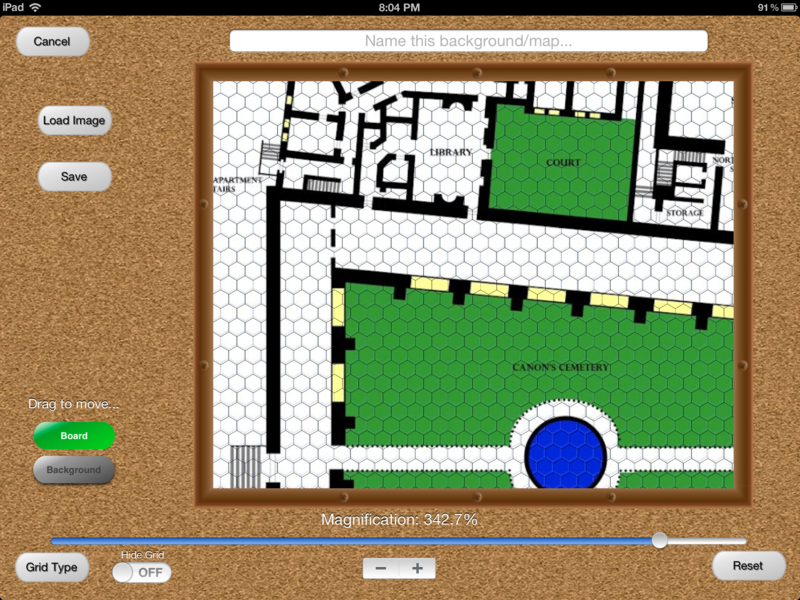 I need to edit it and add a voice track, but here’s a sneak peek of Hex Map Pro 1.1. This is the iPad version (in landscape mode). It starts in Safari with a Google search for “cathedral hex map.” I find a cool map and add it to my Photo library. Then I switch to Hex Map Pro and import the picture and demonstrate how to line up the hex printed on the image with the game board hex. I’m new to this video stuff (including how to embed it into a posting here), so bear with me.